On tonight’s show Damon went with Elena and Bonnie to visit Whitmore College, where Professor Shane was taking over the Occult Studies classes formerly taught by Bonnie’s grandmother. Professor Shane was not too hard on the eyes and Bonnie liked him. At a fraternity costume party, Damon takes advantage of the wild scene to give Elena a lesson in choosing a victim. Elena fed on many people, but when Bonnie saw her, Elena became disgusted with herself. Klaus revealed a long-ago encounter with a powerful group of vampire hunters, but it’s Rebekah who delivered the information that stuns Stefan, there is a cure for being a vampire. Official CW synopsis of next week’s episode: Stefan (Paul Wesley) and Klaus (Joseph Morgan) form an uneasy alliance to try and contain the danger that Connor (guest star Todd Williams) has unleashed on the town. When Connor takes Jeremy (Steven R. McQueen), Matt (Zach Roerig) and April (guest star Grace Phipps) hostage at the Grill, Stefan and Damon (Ian Somerhalder) have a serious disagreement about the best course of action, and Elena (Nina Dobrev) is again caught between the two brothers. The situation quickly turns violent when Klaus sends one of his hybrids, Dean (guest star Blake Hood, “The Young and the Restless”) to stand up to Connor. 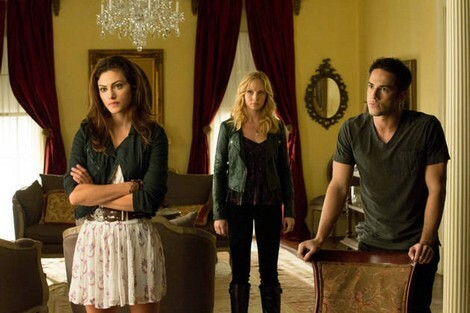 Caroline (Candice Accola) is surprised to find Hayley (guest star Phoebe Tonkin) at the Lockwood mansion. Meanwhile, Professor Shane (guest star David Alpay) works with Bonnie (Kat Graham) to help her get past her fear and guilt. On next week’s show it looks like Connor (Vampire Hunter) has Matt, Jeremy and April and is holding them hostage. Connor screams at them to, “Sit Down!” Matt tells Connor that their friends are going to come for them. Connor responds that every vampire that comes for them is another one he gets to kill. Stefan tells Elena that Connor has Jeremy and they don’t know how many other hostages he has. There is a scene where Connor grabs Jeremy by the neck. I doubt Connor would seriously kill Jeremy because Connor believes Jeremy could be a vampire hunter too. You just know Jeremy is not going to take being held hostage sitting down. He wants to be a hero. Damon is talking to Elena and he tells her, “Hence the open heart surgery!” I assume he is talking about ripping Connor’s heart out. There are a few more scenes with Connor and Jeremy and then we see Connor with a gun and Damon with a gun and Connor says, “A vampire is like a loaded gun, eventually it goes off!” Stefan is looking on. Someone walks in where the hostages are being help and they trip a trip wire and there is an explosion and the man goes flying in the air. Matt and April look on shocked. WOW, looks like a great episode! So many questions! How does Professor Shane play into all this. Is Stefan working with Klaus or with Rebekah. Hopefully, all the answers will be revealed next week! The Vampire Diaries Season 4, Episode 5 “Killer” airs on the CW on November 8th, 2012. Check out the preview video from episode 5 and let us know in the comments below what you think!